As children develop, so do their curiosity with the world around them. Whilst window blinds and window furnishings are not inherently unsafe and many millions are sold every year, there have been instances of injury and child deaths involving accidents with window blind and window furnishings cords and chains. Simple precautions can significantly reduce the risk. We do everything we can to make sure your chosen product is safe for your child. As a minimum, all of our blinds meet the European Standard BS EN 13120 for both performance and safety. Beyond this, safety is at the forefront of our minds right through the design process as we strive to make products that are not only stylish and high-quality, but also safe. Use of additional safety devices may reduce the risk of strangulation or injury but cannot be considered foolproof. Persons in charge of children and vulnerable people are ultimately responsible for following the safety instructions provided by us the manufacturer. The standard also imposes a maximum cord and chain length and minimum fixing heights. This directly affects the minimum distance a looped control cord can be from the floor, and must (in most cases) be fixed to a wall/frame if installed by us. 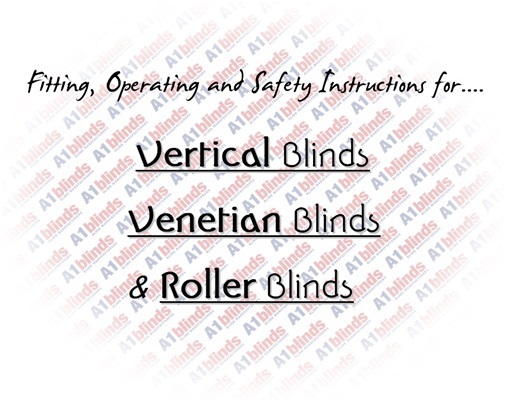 A1 Blinds now install all blinds to comply with the new regulations. We offer a free site survey to inspect existing blinds in public buildings including schools, hospitals and offices. We will provide a detailed report on all blinds that either meet or do not meet the compliance (EN13120) and will advise on the best way to comply with the new law. A lot of traditional blinds now have to be fitted with a safety device if you require corded or chain operation. On blinds such as roller blinds you will not really notice a difference. With rollers we are fitting 'easy break' chain connectors. 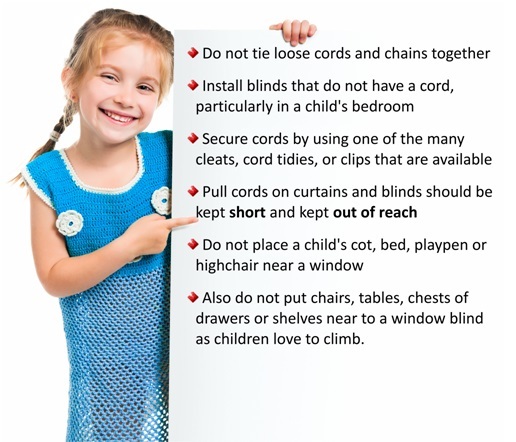 But some blinds such as verticals will now have to have their cords fixed 1.5m above ground level and be retained in a child safety device. Venetian blinds now feature inner cord stop devices (yet will also have to have cleats fitted for the cords to be wrapped around). The regulations do not cover existing blinds installed before the regulations came into force, however if you have any concerns about your existing blinds we can advise on what measures can be taken to make them safer for use around children. There are 'Safe by Design' options available for the majority of standard blinds such as wand operation for vertical blinds and motorised blinds. Hand operated Perfect fit blinds are available for most UPVC windows. A blind which is safe by design has no cords or chains, or the cords are concealed or tensioned. Designed with safety in mind - Perfect Fit Pleated and Roller blinds can be made without cords and fit most modern UPVC windows. Also available as venetian, in addition to the pleated or roller blind options. There are many blinds that can be motorised - this usually removes any hanging cords or chains from the blind - making a safe alternative to traditional operation. Measuring and Installing Yourself? You will be provided with the appropriate safety system (if required by the Safety Standard), and it is up to you whether or not you use it. We would always advise that you use the device. You will be provided with a child safety device with each blind on your order. If for any reason you cannot find it please contact us to request a replacement, before fitting your blind. This should be securely fixed to an adjacent wall at a height from the floor that complies with Child Safety legislation (please see below), out of the reach of children, with the cord/chain continually secured as shown. Vertical, Roller & Roman blinds. This should be fixed to an adjacent wall, out of the reach of children - and the cord/chain left as shown in a secure figure-of-eight - after each operation of the blind. Screw the cleat to an adjacent wall at the required height (please see below). Wooden and Aluminium Venetians, Pleated blinds & Romans. One inner cord stop should be located on each raise and lower cord. All inner cord stops should be located as close to the head rail as possible, and not more than 5cm from the head rail when the blind is fully closed/lowered. Inner Cord Stops shall be supplied with your blind already fitted, located on the raise & lower cords towards where they enter the headrail. 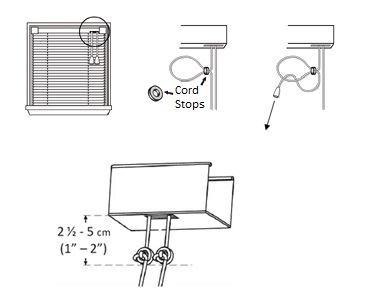 In order to reposition them (if this is ever needed), simply loosen the knot that the cord forms around the circular cord stop – lift up or lower the knot & cord stop together as required – then re-tighten the knot once in desired position (ideally not more than 5cm from the head rail when the blind is fully lowered). 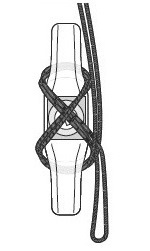 Tightening the knot secures the cord below the head rail and limits the movement of inner cords. The inner cord stops provided can be used on cords with a diameter of 0.8 - 1.5mm. A breakaway chain connector is fitted to all Roller blinds that we manufacture. It has been designed & rigorously tested to come apart under 6kg of pressure. This amount of force has been widely adopted in the industry as the optimum guideline limit - striking a balance between the lowest applied pressure as is feasibly possible whilst still maintaining effective mechanical operation. Ultraviolet light and temperature resistances are also scrutinised during the thorough test process. The breakaway connector can be easily clipped back together, allowing the blind to be used normally afterwards. It shall remain attached to one loose end of the chain if it does break apart. In order for this safety device to be fitted in-line with child safety legislation, the distance from floor level up to the bottom of the cord shall be at least 0.6m (60cm/24in/2ft). A breakaway connector enables up to 4 cords to be terminated, with a single cord exiting from the bottom. The cord connector is made in two halves and is designed so that, when sufficient weight or force is applied between the multiple cords, the connector breaks in half thus preventing them from forming a dangerous loop. The breakaway connector can be easily clipped back together, allowing the blind to be used normally afterwards. 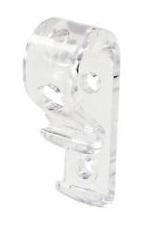 These breakaway devices found on the rear cords on Roman Blinds are the perfect solution to meet child safety. These cord breakaways are designed to 'snap' away if excess force is applied, they can simply be 'snapped' back in again to resume operation of the blind. CLEAT - securely fitted at least 1.5m from floor and as near to headrail as possible. P-CLIP Tensioning Device - securely fitted at the maximum distance from the headrail and at least 1.5m from the floor. Why not take this opportunity to inspect all your blinds in the home - if they do not have a safety device fitted in the interest of safety you should fit one. For assistance with the correct cleat for the blind in question please contact us and we can advise cost of component/s and supply them should you require additional cleats. If you have any questions regarding child safety and blinds, or want advice on how to improve a current blind, please do not hesitate to contact us. 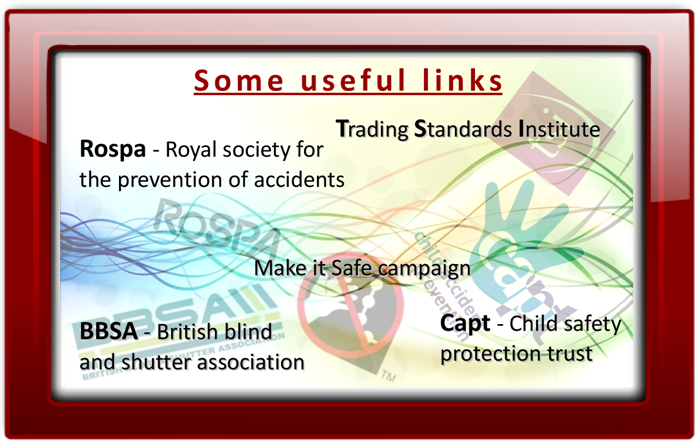 We can talk you through the types of safety devices on offer and supply you with ones to fit to your existing blinds. Window coverings can pose a danger to small children. Please be aware that swallowing small parts can cause internal asphyxiation. Looped or low hanging cords, chains or tapes can also cause strangulation. All safety devices must be correctly installed for the protection from strangulation of young children and the proper use of the blind.